Paper for iPad has been updated – duplicate pages, move pages and more! 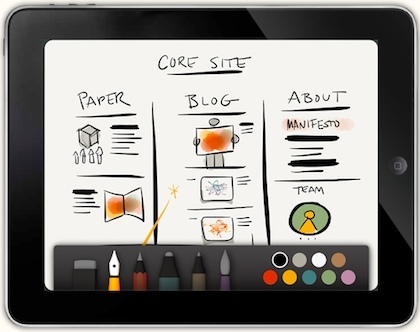 Remember the Paper app for the iPad? Electronic notebooks of plain paper with multiple types of writing instruments. Most people know the app for how well digital inks work… smooth and exactly as you expect a pen should work. While the app is very nice for quick sketches, those sketches can be enhanced with shading and variable thickness lines that really bring the drawing alive. The high detail drawing/painting is left to other apps, Paper is that app you open quickly to sketch a thought to remember or explain. Works great with stylus pens. The list of updates is features that will actually get used. Not some more stamps or borders, with the Paper app the updates started getting used right away. The first update to Paper is the ability to move a page from one notebook to another!! Just tap and hold on the page, drag it out of the notebook (keep holding your finger on it), with your other hand, pinch to close the notebook, swipe through the notebooks till you find that one needing the page, tap it to open, swipe to the location, then drag/drop the page your holding! Wow… very cool way of doing that feature we didn’t think we would every have! ★ Move. Grab any page or journal with a simple press and hold and use multi-touch gestures to open, close, and swipe for the fastest way to get around. ★ Duplicate. Press and hold the “+” button to make copies of your favorite pages and journals. 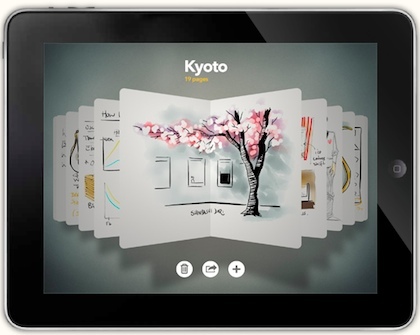 Duplicate sketches, create templates for layouts, wireframes, or storyboards, or create multiple variations of an idea. ★ Faster Ink. Every tool, now up to 3x faster. Drawing is more responsive and precise than ever before. ★ Edge-to-Edge Drawing. Draw to the edge and beyond. The full screen is your canvas. ★ Easy Add. Never hit the end of a journal. Just swipe from the edge to add another page. ★ Better Rewind. More intuitive feel, and the faster you go the more you rewind. ★ Custom Sharing. Tap on a service icon to customize your share settings like setting your own default Tumblr captions and tags. If you want Paper on your iPhone, sorry to say isn’t available. We did find and many of us are using ‘Draw’ (Draw Book Mobile).